Pitmaster Josh Cary and Chef Tom Jackson talk about one of their favorite food films, the classic 1985 Japanese film Tampopo and then cook up some ramen noodles with a smoke roasted whole chicken. To cook the ramen, bring a gallon of water to a boil. Add the ramen and cook until tender, about 3-4 minutes. Strain and set aside. To cook the eggs, bring 1 gallon of water to a boil and turn down to a simmer. Carefully lower the eggs into the simmering water. Adjust the temperature so that the water continues to simmer. Cook for six minutes. Remove from the hot water. Place in a bowl. Run cold water over the eggs. Let the eggs sit in the cold water until cooled. Carefully crack and peel the shells from the eggs. 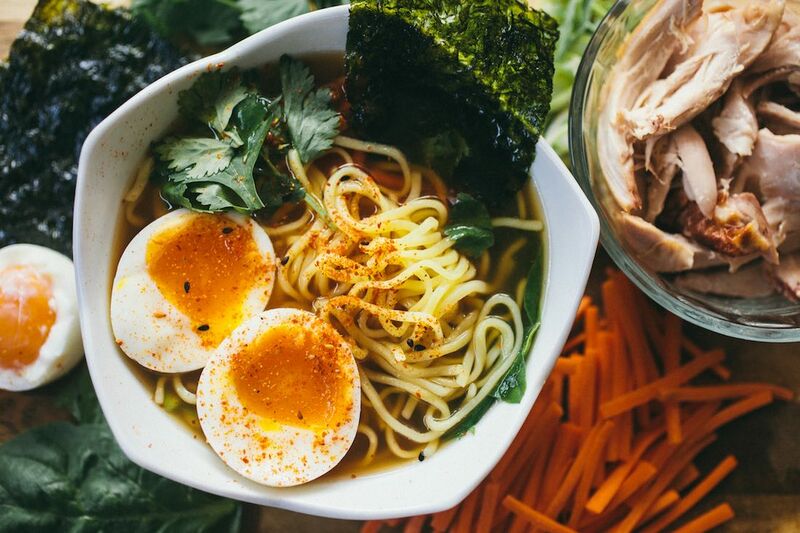 Wait until ready to garnish your ramen to slice in half. To make the broth, bring the chicken stock to a simmer. Add the soy sauce, ginger and garlic. Let simmer at least 10 minutes to infuse the flavors. Spoon out the ginger and discard. In a large bowl, begin layering in the chicken, spinach, carrot, green onion and noodles. Pour the simmering broth over the ingredients in the bowl. Top with cilantro, nori and the split soft boiled egg. Serve immediately.